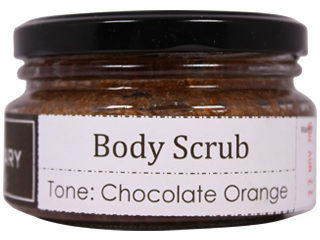 These scrubs cleanse, exfoliate and intensively moisturise while they stimulate lymph and blood circulation. The result is smooth, toned and gloriously radiant skin. They contain therapeutic aromas to lift the spirits and clear the mind, and oils to pamper and protect. Massage gently into warm, wet skin in a circular motion. Work from extremities towards your heart. No need to moisturise further. These scrubs are safe for facial skin, excellent on hands and brilliant for rough or tired feet. TONE: The classic Christmas combination of chocolate and oranges works hard to cleanse, tone and moisturise; combat cellulite; and treat skin ailments; while the delicious aromas fills your spirits with good cheer. SOOTHE: Comfort body and mind with the calming and uplifting aroma of rose geranium and the healing power of Rooibos. 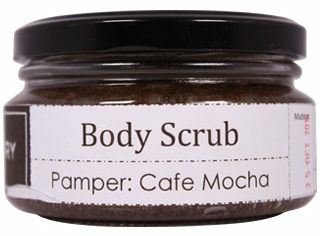 This soothing smoothing scrub helps ease both skin irritations and mental anxiety. PAMPER: Let the rousing aromas of coffee, cinnamon and chocolate awaken your senses while this scrub tones and softens your skin. Bursting with anti-oxidants and renowned anti-cellulite ingredients. REVIVE: Breathe in the fresh, therapeutic aromas of Rosemary and Peppermint, renowned to clarify both mind and body. 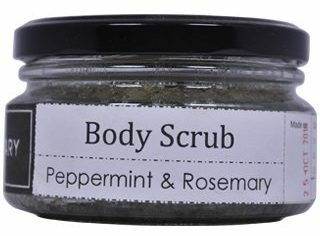 This invigorating scrub will focus the mind and cool and tone the skin.